Welcome to the most powerful, versatile, and easy to use electronic pilot logbook system. A free trial account lets you try essentially all Safelog features on a no-obligation basis, though you will be limited to the total number of flights you will be able to enter. After you sign up, you can use your trial account username and password to access your pilot logbook here at SafelogWeb.com or via any or all of the other Safelog apps including PC, Mac, iPhone, iPad, and Android. Safelog is designed so that your data syncs seamlessly between all of your Safelog devices. The best way to check out Safelog is to sign up for a free trial above.. You can even start with one of the client versions (PC, Mac, iOS, or Android) and create a demo account there. However, you can also see how Safelog looks with a bunch of data already populated by logging in to one of the pre-configured accounts below. The flight data in these isn't terribly realistic in some sense, but it can nevertheless give you an idea of how things work. These are, of course only examples - Safelog can be configured in tens of thousands of ways to suit the way you fly and log. 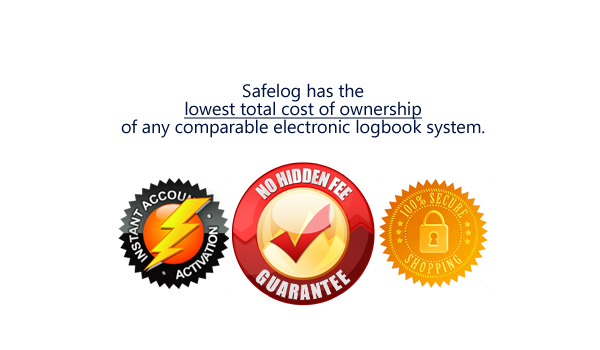 Safelog costs less and does more than any competing logbook system. Safelog licenses are sold by the year; most pilots purchase multiple-year subscriptions as this gets them the best price. Compare our prices with those of any of our serious competitors and you'll find that our pricing is highly competitive. We can offer such great pricing as we have a large, loyal, and constantly growing user base. With your Safelog subscription, everything is included except for a few bespoke professional services*: unlike our competitors we do NOT charge for data synchronization, specialized database usage, updates and uprgrades, "platform fees", "cloud fees", or any of the other stuff our competitors nickel and dime their customers with. With Safelog, there are no hidden fees whatsoever and you get access to ALL of the Safelog platforms (web, PC, Mac, Android, iPhone/iPad, etc) with your subscription. It's possible to buy a Safelog subscription via any of our apps or services - for example, you can buy a new subscription or extend your existing subscription from the official app stores / app markets within our mobile apps. No matter where you purchase your subscription, you'll be getting the same thing. That said, the price of a subscription varies a bit depending on where you buy it due to currency, tax, and app store pricing policy issues. In general, however, pretty much all users will get the best price via our SafelogWeb.com Portal. That is, go to SafelogWeb.com, sign up for a free account (or sign in to your existing trial account), and then click on the 'My Account' screen to purchase a paid subscription. If you have any questions whatsoever about pricing or related issues, we're happy to help via our online helpdesk. Thank you again for your interest in Safelog and we hope to welcome you as a user soon! * The vast majority of Safelog users happily use our system on a standard subscription and never need or want any additional bespoke / personalized services. A small number of our users and corporate clients request or require from us highly personal services for which we naturally are obliged to charge professional (typically hourly) rates. Such cases are rare and include (but are not limited to) things like customized logbook analysis, data entry services, and custom programming / technical services. ** Pricing subject to change without prior notice. Taxes/VAT and fees for certain payment types may be extra and are as determined by our merchant reseller partner Digital River / SWreg, an industry leading firm speacializing in ensuring that the transactions that go through them are secure and reliable.